The Preston family of Preston were major landowners in the town from at least the middle of the 13th century until near the end of 17th century. They established themselves as leading merchants and lawyers in Ireland while continuing to serve in public office in Preston and to manage their estate there. The Gray Freres College in the north-west side of the Lancashire, toune of Preston in Acmundrenes was sette in the soile of a gentilman caullid Prestun, dwelling yn the town self of Preston, and a brother or sunne of his confirmid the first graunt of the site of the house, and one of these was after a great man of possessions, and Vicount of [Gurmaston], as I hard say, in Ireland. Diverse of the Prestons were buried yn this house. However, there is evidence that the friary was established before Edmund became involved for the Close Rolls show that on 25 October 1260 Henry III granted to the Friars Minor of Preston five oaks in Sydwood, Lancaster, for building. It was presumably on the land gifted by the de Prestons that they intended to build, subsequent bequests from Edmund fostering the friary’s development. A short history in the printed edition of the Gormanston Register (which contains a superb collection of 14th-century Preston deeds) supplies further information. It traces the family of Preston to Adam, son of Philip, living in Preston towards the end of the 13th century (see pedigree above). This Adam had three sons, William, Richard and Roger. The first two developed trading links with Drogheda across the Irish Sea. In 1307 William married Margery or Margaret, daughter of John Cosyn of Drogheda and by 1313 he was established in the town as one of the burgesses, by which time his brother Richard had joined him. According to the Gormanston Register account, in 1318 a William and a Richard de Preston were among the followers of the Earl of Lancaster pardoned by the king. It is not known if these were the William and Richard of Drogheda. The William and Richard who had settled in Ireland transferred their Preston possessions to their brother Roger in 1333 when he was still living in the town, and by 1346 William seems to have been largely forgotten in Preston because in sealing a deed he had to add the Drogheda seal to his own as his ‘is unknown to many’. 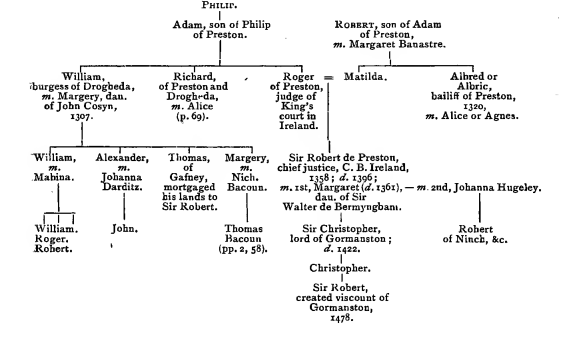 Roger stayed in Preston, where he married Matilda, daughter of Robert, son of Adam of Preston, and brother of Albric (see below). Matilda’s mother was Margaret Banastre, of the Preston Banastres. The Gormanston editors suggest the marriage took place about 1312 when Margaret confirmed Matilda’s possession of land given by her father. Roger later established himself as a lawyer in Ireland, being appointed second justice of the Justiciar’s Court in 1326, a position confirmed in 1328. In 1331 he was serving at the Court of Common Pleas. He was living at Drogheda at this time, having acquired houses there, and, in 1331, being described as a burgess of the town. The editors believe Roger was again living in Preston by 1333 when his brothers conveyed their property in the town to him. In 1334 he was back in Ireland on lawyerly duties, leaving his brother-in-law Albric to manage his affairs in Preston while he established a landed estate in Ireland. Roger died before 1350, probably in 1346 when his brother William granted the possessions in Preston to Roger’s son Robert, which he had previously given to Roger. At the same time Robert the son employed lawyers in Ireland to look after his affairs there, suggesting he had inherited his father’s estate. Roger’s brother-in-law Albric owned much property in Preston, where he married Alice, or Agnes. At his death his sister Matilda, widow of Roger de Preston, inherited his estate in Preston. He would appear to have died before 1350 for in that year Matilda gave her son Robert the estate she had inherited from her brother, together with the property inherited from her mother. By 1359 Matilda had settled in Dublin, where she acquired a stone house and land. Robert like his father was a lawyer, but may have initially studied and practised in England, given that he was appointing attorneys to handle his affairs in Ireland in 1346 and was acquiring property in Preston between 1344 and 1350 when the rest of his family was settled in Ireland. By 1355 he was in Ireland, married, and practising as a lawyer, being appointed chief justice of the court of common pleas in 1358. His career in Ireland progressed and his estates their extended. In 1361 he was knighted and in 1363 bought the Gormanston estate. Sir Robert died in 1396, being succeeded by his son Christopher. Fishwick concludes that the last Preston of Preston was another William who died in 1667, followed by his widow Mary in 1689. A deed of 1683 shows that by then his considerable estate in the town had passed into the hands of the Molyneuxs and Rigbys. William’s estate included his ‘mansion in Preston called the Hall at the Towne-end’ (Townend Hall, at the bottom of Friargate, was also known as Preston Hall. See plan); also the Peele Hall and Arram House. Other Prestons can be found in the guild rolls up until 1722. Henry Fishwick, The History of the Parish of Preston (Rochdale: The Aldine Press, 1900), 19. Lucy Toulmin Smith, The Itinerary of John Leland in or about the Years 1535-1543, vol. 2 (London: George Bell and Sons, 1908), 20, https://archive.org/details/itineraryofjohnl02lelauoft. William Farrer and J. Brownbill, eds., The Victoria History of the County of Lancaster, vol. 7 (London: Constable, 1912), 161. James Mills and M. J. McEnery, eds., Calendar of the Gormanston Register, from the Original in the Possession of the Right Honourable the Viscount of Gormanston (Dublin, printed at the University Press, for the Royal Society of Antiquaries of Ireland, 1916), iv–xiii. Fishwick, The History of the Parish of Preston, 217. ‘DDF/1055. Preston-Gormanston Inheritance’, Lancashire Archives Catalogue, 1603, http://archivecat.lancashire.gov.uk/CalmView/Record.aspx?src=CalmView.Catalog&id=DDF%2f56%2f1055&pos=1. Fishwick, The History of the Parish of Preston, 78. ‘DDPD/11/45 William Preston’s Estate’, Lancashire Archives Catalogue, 1683, http://archivecat.lancashire.gov.uk/CalmView/Record.aspx?src=CalmView.Catalog&id=DDPD%2f11%2f45&pos=1.